This Yorkshire harpist performs on a stunning black harp with gold detailing and has a range of beautiful gowns to coordinate with your colour scheme. Her harp performance adds gravitas during a civil or partnership ceremony, gives a modern touch in church, and entertains during drinks and the wedding breakfast. 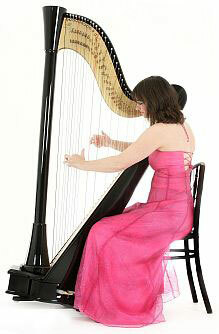 She has been hailed as one of most exciting new harpists from the North. Her repertoire ranges from wedding favourites like Canon in D and Robbie Williams Angels, through jazz, Indie, and traditional folk to Bollywood harp and beyond. Since graduating in music at York University, she has toured the country at intimate theatres, venues and festivals. Her three albums of original music include numerous award winning songs. She performs on a stunning glossy black pedal harp at numerous top venues and high profile events: equally at home with classical, indie or world music, she has a wide popular music repertoire. 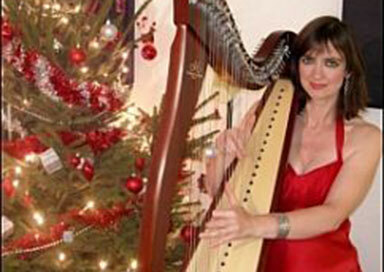 Her beautiful voice-compared to Linda Ronstadt and Karen Carpenter- is woven into some of her harp arrangements. She has become a renowned exponent of romantic songs with the harp and was the only English harpist to join ten others from all over the World at The International Harp Festival, Sentmenat, near Barcelona in June 2010. She has performed for the Annual Pride Ball and supported The Opera Babes at Birmingham ICC. 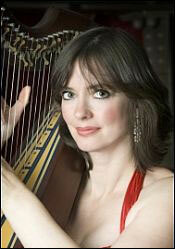 She has performed solo harp in the background, and a more upfront set with popular harp and vocal pieces.